In French, whenever a word ending in a consonant sound is followed by a vowel or h muet, that consonant sound is transferred onto the next word. This euphonic technique is called enchaînement and it’s one of the aspects of French pronunciation that sometimes makes it difficult to determine where one word ends and the next begins. The first word does not necessarily have to end in an actual consonant, just a consonant sound. The many French words that end in e muet effectively end in a consonant sound and thus enchaînement is required. The main difference is that enchaînement occurs with consonants that would be pronounced whether or not they were followed by a vowel (e.g., sept enfants), whereas liaisons occur with normally silent consonants: they are only pronounced because of the vowel or mute h that follows (mes enfants). 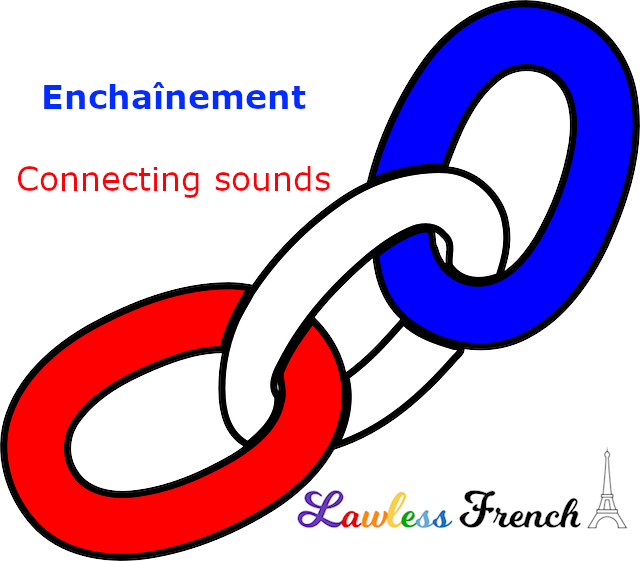 While liaisons are a linguistic and stylistic feature of pronunciation, enchaînement is nothing more than phonetics. In French, closed syllables are undesirable, so when a consonant sound at the end of one word is followed by a vowel at the beginning of the next, the two flow together to prevent what would otherwise be a closed syllable. For example, instead of [ehl eh] (closed – open), we say [eh leh] (open – open). This is part of French’s musical rhythm. Non, pas du tout. Comme j’ai mentionné à la fin, les liaisons sont différentes. Je les expliquerai dans une autre leçon.